For the former badminton player, see Alan Parsons (badminton). 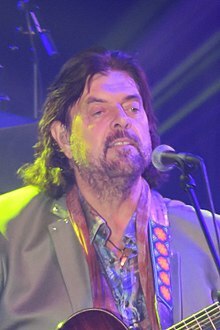 Alan Parsons (born 20 December 1948) is an English audio engineer, songwriter, musician, and record producer. He was involved with the production of several significant albums, including the Beatles' Abbey Road and Let It Be, and the art rock band Ambrosia's debut album Ambrosia as well as Pink Floyd's The Dark Side of the Moon for which Pink Floyd credit him as an important contributor. Parsons' own group, the Alan Parsons Project, as well as his subsequent solo recordings, have also been successful commercially. In October 1967, at the age of 18, Parsons went to work as an assistant engineer at Abbey Road Studios, where he earned his first credit on the LP Abbey Road. He became a regular there, engineering such projects as Wings' Wild Life and Red Rose Speedway, five albums by the Hollies, and Pink Floyd's The Dark Side of the Moon, for which he received his first Grammy Award nomination. He was known for doing more than what would normally be considered the scope of a recording engineer's duties. He considered himself to be a recording director, likening his contribution to recordings to what Stanley Kubrick contributed to film. This is apparent in his work with Al Stewart's "Year of the Cat", where Parsons added the saxophone part and transformed the original folk concept into the jazz-influenced ballad that put Stewart onto the charts. It is also heard in Parsons' influence on the Hollies' "He Ain't Heavy, He's My Brother" and "The Air That I Breathe", sharp departures from their popular 1960s hits "Stay", "Just One Look", "Stop! Stop! Stop!" or "Bus Stop". Parsons was also known to have swapped shifts during the engineering of Dark Side of the Moon so he could work entirely on the project. Parsons also produced three albums by Pilot, a Scottish pop rock band consisting of Ian Bairnson on guitar, Stuart Tosh on drums, and David Paton on lead vocals, guitars, bass and William (Billy) Lyall, on piano and keys. Their hits included "January" and "Magic". He also mixed the debut album by the American band Ambrosia and produced their second album Somewhere I've Never Travelled. Parsons was nominated for a Grammy Award for both of these albums. In 1975, he declined Pink Floyd's invitation to work on the follow-up for Dark Side, Wish You Were Here, and instead initiated the Alan Parsons Project with producer, songwriter, and occasional singer Eric Woolfson, whom he had met at Abbey Road. The Project consisted of a revolving group of studio musicians and vocalists, most notably the members of Pilot and (on the first album) the members of Ambrosia. Unlike most rock groups, the Alan Parsons Project never performed live during its heyday, although it did release several music videos. Its only live performance during its original incarnation was in 1990. It released ten albums, the last in 1987. The Project terminated in 1990 after Parsons and Woolfson split, with the Project's intended 11th album released that year as a Woolfson solo album. Parsons continued to release work in his own name and in collaboration with other musicians. Parsons and his band regularly toured many parts of the world. Although an accomplished vocalist, keyboardist, bassist, guitarist and flautist, Parsons only sang infrequent and incidental parts on his albums, such as the background vocals on "Time". While his keyboard playing was very audible on the Alan Parsons Project albums, very few recordings feature his flute. He briefly returned to run Abbey Road Studios in its entirety. Parsons also continued with his selective production work for other bands. Of all his collaborators, guitarist Ian Bairnson worked with Parsons the longest, including Parsons' post-Project albums, Try Anything Once, On Air, and The Time Machine. In 1998, Parsons became Vice-President of EMI Studios Group, including the Abbey Road Studios. He soon left the post, deciding to return to more creative endeavours. Parsons remained as a creative consultant and associate producer for the group. As well as receiving gold and platinum awards from many nations, Parsons has received ten Grammy Award nominations for engineering and production. In 2007 he received a nomination for Best Surround Sound Album for A Valid Path. Beginning in 2001 and extending for four years, Parsons conceived and led a Beatles tribute show called A Walk Down Abbey Road featuring a group of headlining performers such as Todd Rundgren, Ann Wilson of Heart, John Entwistle of the Who, and Jack Bruce of Cream. The show structure included a first set where all musicians assembled to perform each other's hits, and a second set featuring all Beatles songs. Since 1999 he has toured under a revised name, the Alan Parsons Live Project (with Woolfson's permission). The band currently features lead singer P. J. Olsson, guitarist Jeff Kollman, drummer Danny Thompson, keyboardist Tom Brooks, bass guitarist Guy Erez, vocalist and saxophonist Todd Cooper, guitarist and vocalist Dan Tracey, along with Parsons on rhythm guitar, keyboards and vocals. This band performed live in Medellín, Colombia in 2013 as Alan Parsons Symphonic Project in a performance recorded for Colombian television and also released on CD (live 2-CD) and DVD (May 2016). In May 2005, Parsons appeared at the Canyon Club in Agoura Hills, California, to mix front-of-house sound for Southern California-based Pink Floyd tribute band Which One's Pink? and their performance of The Dark Side of the Moon in its entirety. In 2010, Parsons released his single "All Our Yesterdays" through Authentik Artists. Parsons also launched a DVD educational series in 2010 titled The Art and Science of Sound Recording (ASSR) on music production and the complete audio recording process. The single "All Our Yesterdays" was written and recorded during the making of ASSR. The series, narrated by Billy Bob Thornton, gives detailed tutorials on virtually every aspect of the sound recording process. During 2010, several media reports, one of which included a quote from a representative of Parsons, alleged that the song "Need You Now" by country music group Lady Antebellum used the melody and arrangement of "Eye in the Sky". Parsons produced Jake Shimabukuro's album, Grand Ukulele, which was released on 2 October 2012. Also in 2012, he contributed lead vocals and performed keyboards and guitar on the track "Precious Life" by German electronic music duo Lichtmond, and appeared with many other noted progressive-rock musicians on The Prog Collective album by Billy Sherwood, singing lead on "The Technical Divide." Parsons engineered the third solo album by Steven Wilson, The Raven that Refused to Sing (And Other Stories), released on 25 February 2013. In late 2013, a live album recorded on tour in Germany and Austria with the title LiveSpan was released, accompanied by a single called "Fragile" with Simon Philips on drums. Legacy Recordings, the catalogue division of Sony Music Entertainment, celebrated the 35th anniversary of Eye in the Sky, with the worldwide release of a definitive deluxe collector’s box set, featuring rare and unreleased material, on November 17, 2017. In August 2018, Parsons announced that he will be releasing a studio album in 2019. The album titled “The Secret” will be his first in 15 years. Parsons was born in London. He resides in Santa Barbara, California, with his wife Lisa and her two daughters, Tabitha and Brittni, as well as numerous pets. He has two sons, Jeremy (Jerry) and Daniel, from his previous marriage. 15 June 2010 All Our Yesterdays / Alpha Centauri (2010) Authentik Artists, Inc.
^ a b "Alan Parsons - Bio FAQ Discography". 12 December 2009. Archived from the original on 12 December 2009. Retrieved 5 October 2017. ^ "iTunes – Music – All Our Yesterdays – Single by Alan Parsons". Itunes.apple.com. 15 June 2010. Retrieved 8 November 2011. ^ "Alan Parsons' Art & Science of Sound Recording". Artandscienceofsound.com. Retrieved 8 November 2011. ^ "Lady Antebellum vs. The Alan Parsons Project". Freshmilc.com. Retrieved 8 November 2011. ^ "People accusing Lady Antebellum of stealing Alan Parson song". Tampabay.com. 18 November 2010. Archived from the original on 6 November 2011. Retrieved 8 November 2011. ^ Rodgers, D. Patrick (11 November 2010). "Alan Parsons' Camp Alleges Lady Antebellum Rip-Off". Nashvillescene.com. Retrieved 8 November 2011. ^ "Alan Parsons Announces First New Album in 15 Years". Ultimate Classic Rock. Retrieved 31 August 2018. ^ "The Alan Parsons Project - The Collection". Discogs.com. Retrieved 5 October 2017. ^ "Live in Colombia". Smile.amazon.com. 10 February 2017. Retrieved 5 October 2017. ^ "All Our Yesterdays". Smile.amazon.com. Retrieved 5 October 2017. ^ "Alan Parsons - Fragile". Smile.amazon.com. Retrieved 5 October 2017. ^ "Do You Live at All?". Smile.amazon.com. Retrieved 5 October 2017. Wikimedia Commons has media related to Alan Parsons. Crawdaddy! "Parsons Knows: The Tale of Alan Parsons and Edgar Allan Poe"